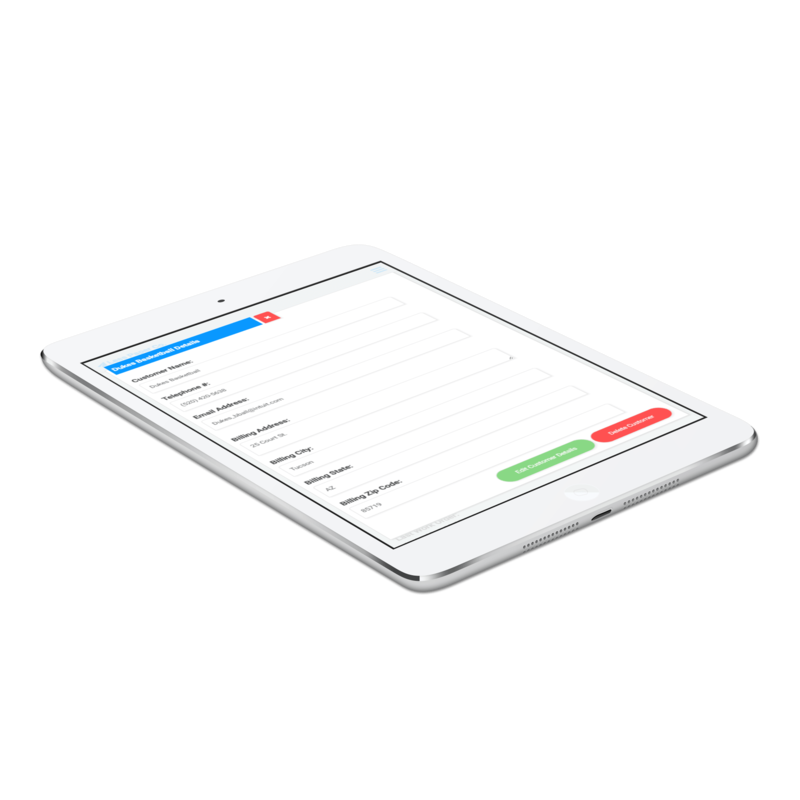 Custom Work Order Management Systems - Less Paper Co. Custom work order management systems. Get a tailor-made work order management system that has everything you need. We'll work hard so you don't have to. 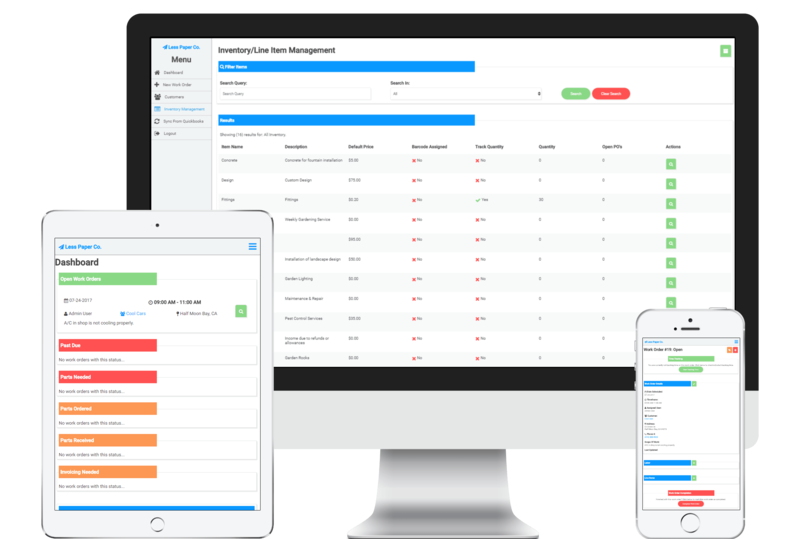 Increase efficiency throughout your entire team with easier scheduling, staying up to date on work order statuses and more. We specialize in providing custom-built work order management systems, work order management systems, inventory management systems and scheduling systems for businesses like yours. And much more. Everything you need at affordable rates. 100% custom-built solutions tailored to your needs. We'll help your business be more productive and reduce costly mistakes. 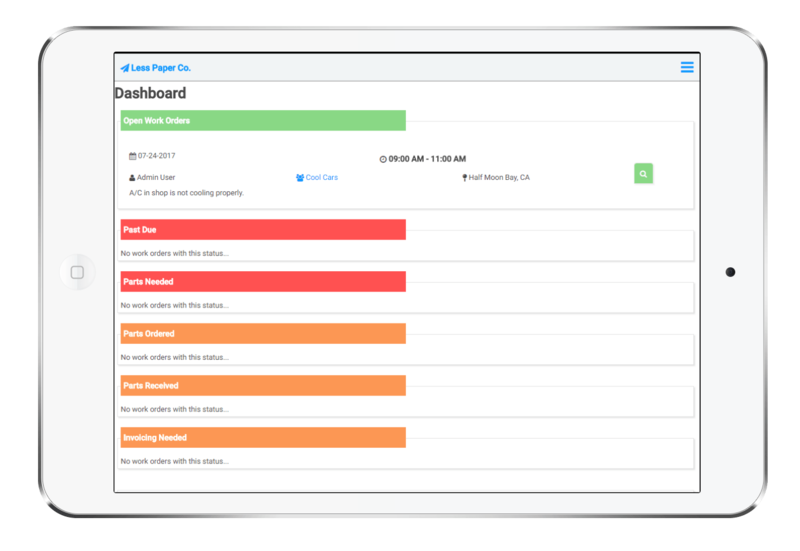 Our work order management systems are built to increase efficiency for your entire team by automating many of your daily processes. With access to your work order management system from any device your office and field staff will always be up to date on open jobs. Use our work order management systems to increase productivity with office & management tools at your disposal. Features customized to suit your specific needs. Your business is unique. Shouldn't your work order management system be unique also? Countless features to keep your business organized and productive. And when we say countless we literally mean countless. But we'll list our most requested features. that make life a little easier. Easy to use calendar-based scheduling to easily see what you have scheduled at any given time. Add color coding features for even more at-a-glance insight. Want to plan more efficient routes? We can show your appointments and allow you to schedule directly on a map to help your dispatchers schedule more efficiently. Have customers on recurring preventative maintenance plans? Run a set route each week? Add recurring appointment features so you won't have to remember to add them later on. Add anything you want to on your schedule. On calls? Got you covered. Notes? Tasks? Meetings? We can add options to allow you to schedule anything you need. Because our systems are created 100% custom to the needs of your business you aren't limited by the features we list here. If you can dream it up we can probably work it up. We'll design your system to work perfectly for you. to help you stay on top of things. From the start of a job through ordering parts and completion you can have the ability to easily stay on top of work orders so no job gets left behind. Color code your different job types, work order statuses and more for easy at-a-glance insight as to which work orders need your attention the soonest. Dispatch your staff easily or remind customers of upcoming appointments with SMS & email notification options. You can even ask for confirmations via reply or clicking a link. No more messy paperwork with sloppy handwriting. Your staff can easily fill out digitized versions of your work orders and collect payments and signatures in the field. Automatically keep track of labor via 'check in' and 'check out' of job features and allow your staff to add line items to work orders. We can automatically calculate the total your staff should collect from the customer. so you know when to order more coffee. Always know how much inventory you have left for any of your stock items. Manually change stock amounts or have inventory automatically deduct as they're used on work orders. With the ability to have as many locations, trucks or bins as you'd like you will always know if something is in stock and where it's at. Set up notifications to know when you're running low. Keep track of your manufacturers, vendors and prices. When adding a new inventory item manually enter your price or just enter the cost and let your system automatically add the markup for you. Use purchase orders when ordering parts? Your system can keep track of them, allow you to track items via tracking #'s and easily receive items into inventory when they arrive at your location. so you can get even more done. Generate PDF copies of work orders on the fly and either email them out to customers at will or save a step and have them automatically email as work orders are completed. Integrate our voicemail or auto answering services in your Less Paper Co. system to have easy access to calls and automatic dispatch of emergency calls to your on call personnel. Let your staff easily clock in & out for the day to keep track of their hours. Use these hours for payroll, to avoid overtime or for productivity reporting. Inventory reports, warranty call reports, productivity report, payroll reports and more. We can keep track of whatever you need us to to ensure you get the statistics you need. to automate more of your daily processes. Quickbooks Online integration allows you to easily convert completed work orders to invoices and email the to customers immediately. You can also sync your customers & inventory items. 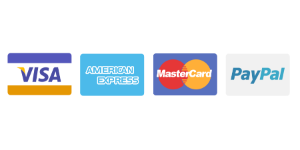 Allow your office or field staff to collect payments in the field by using an online payment processor with an API such as PayPal or Stripe. 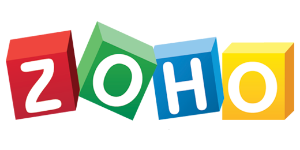 Zoho integrations can be used for invoicing (like Quickbooks Online) or many of their other services such as their CRM, Reports and more. 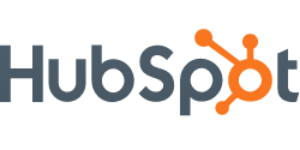 You can integrate with your Hubspot account to manage contacts, deals, forms or your Hubspot calendars. 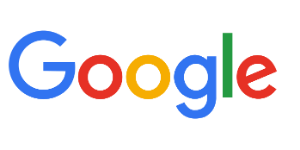 From Google Maps to Google Calendar and more you'll be able to access the features you already use and need most. ...And More. We can integrate into any of your current favorite software/apps as long as they are internet-based and have an API we can use. Our clients love us a lot. And we have a feeling you'll love us too. 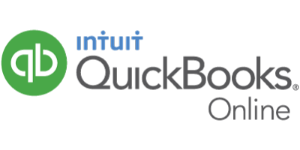 "Perfect for our needs with incredibly fast support and seemless integration with [QuickBooks Online]." -Mark, Encompass A/V via Capterra. "The customer service is the best I have ever encountered. Every time I need help, I get it." "Vast improvement over paper invoices! Less Paper Co. is great to work with!" -LaRay, AW HVAC via Capterra. Perfect for your business. Affordable for all businesses. Switching to a work order management system shouldn't break the bank. *Free setup fees are limited to 10 development hours (Small Business), 20 Development Hours (Medium Business) and 30 Development Hours (Enterprise). *100% Satisfaction Guarantee: Please see our Service Agreement for details. Ready to get started with your custom system? Contact us below with any questions or to start your free consultation today. We'll usually reach out to you within 15 minutes! *What is the name of your company? Download A Guide To Choosing A Work Order Management System. A free guide to help you during your journey towards choosing a work order management system. Discover the benefits of having a work order management system. Learn how to choose the best system for your business. 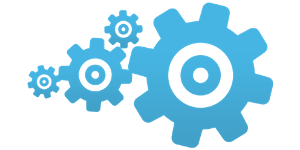 Learn more about our system and the process behind our custom work order management systems. Your request to get started with your custom work order management system has been sent! Be sure to check your email shortly because we'll usually reach out to you within 15 minutes to start your free consultation. info@lesspaperco.com and we will promptly remove you from ALL correspondence.